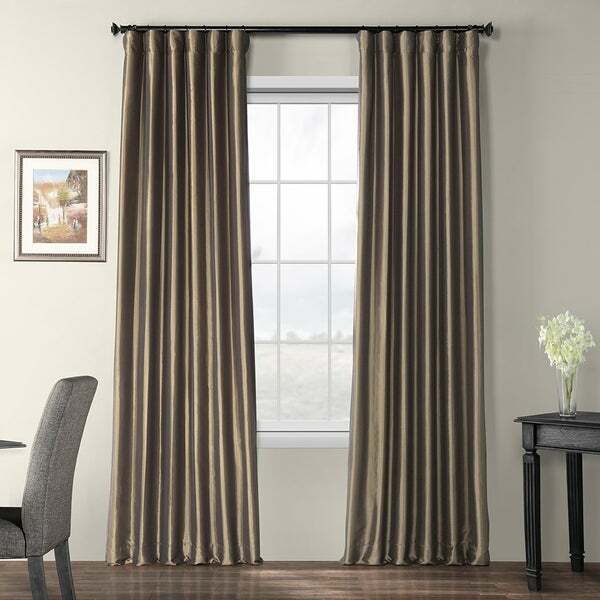 Our blackout faux silk taffeta drapes and curtains are an exclusive. Our polyester nylon blend taffeta will offer you a crisp smooth panel that will shimmer and reflect the light in any room. Please note that faux silk taffeta has natural crinkles in the fabric, this is not considered a flaw or defect. For proper fullness panels should measure 2-3 times the width of your window. Would have rated 5 stars but for having to completely re hang my curtain rods with heavy reinforcement. But the end result is beautiful. Would have bought 4 but could only afford 2 which I combined with sheers backed up by moveable blackout curtains. They are really well made, beautiful color and fabric. Completely blackout and I would imagine energy efficient. Would buy again. Love the quality of these panel curtains. The color is very rich and quality of the panel is wonderful. I love that they come fully lines. Definitely helps if you are looking for a little room darkening. These are beautiful curtains. Look great in my guest bedroom and block the sun. I will purchase more in the future in a different color. Great quality curtains with a dramatic flair! Love the color, love the silky shiny material, iridescent. Would have kept them but the 84" and the 96" curtains were off in color. they just didn't match well. Looked like two different shades of brown. Beautiful heavy lined drapes that will transform your home. Extra wide and long with room darkening bonus. Great for a Tucson feel. You won't be disappointed!